With power categories ranging from 3.8 kW to 15.0 kW, the transformerless Fronius Primo is the ideal compact single-phase inverter for residential applications. The sleek design is equipped with the SnapINverter hinge mounting system which allows for lightweight, secure and convenient installation. 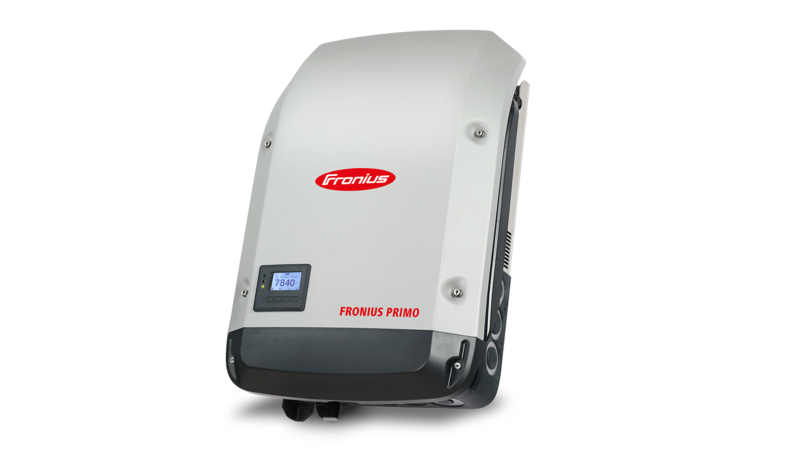 The Fronius Primo has several integrated features that set it apart from competitors including dual powerpoint trackers, high system voltage, a wide input voltage range, Wi-Fi* and SunSpec Modbus interface, and Fronius’ online and mobile monitoring platform Fronius Solar.web. The Fronius Primo also works seamlessly with the Fronius Rapid Shutdown Box for a reliable NEC 2014 690.12 and NEC 2017 690.12(B)(1) solution. The Fronius SnapINverter generation features a simple, standardized hinged mounting system that makes installation and service easier than ever. The inverters consist of two main parts: the power stage and the connection compartment, ensuring a convenient installation process. First, you mount the remarkably lightweight connection compartment and all wiring to the wall. Then simply snap the power stage in - allowing for installation within 15 minutes by only 1 person! Furthermore, installers don’t need to remove the entire inverter for servicing. Just take the power stage and leave all wires in place, making the Fronius SnapINverters the most user-friendly inverters on the market. Fronius believes that every solar system should be monitored. Therefore, we offer integrated data communication capabilities for all our inverters and free online monitoring with Fronius Solar.web. Simply connect the inverter to the internet via Wi-Fi and use our Modbus TCP SunSpec, Modbus RTU SunSpec or Fronius Solar API (JSON) interface for seamless data communication to third parties. The different interfaces can be operated in parallel to the Fronius Solar.web online platform. The monitoring is easily set up via our smartphone app - it's so easy, even the home owner can do it. Fronius inverters enable the grid of tomorrow. Our inverters are already equipped to meet the technical requirements of a smart grid of the future. A set of smart functions, known as Advanced Grid Features, are built into the inverters. They include a wide range of control functions for dynamic feed-in of both effective and reactive power. These functions are designed to enable a stable grid and highest solar density, while preventing unwanted system shutdowns if grid parameters exceed their thresholds. The Fronius Arc Fault Circuit Interruption (AFCI) makes each inverter NEC 2011 compliant and offers a best-in-class solution for detecting arcs. Ensuring the utmost safety, AFCI shuts down the inverter in the event of an arc fault within your solar system. *) Inverter rated for up to 1000 V open-circuit. Nominal, Operating, and MPP voltages based on 600 V system design. Actual DC system voltage is dependent on PV string-sizing, not inverter input capacity.